Posted on September 25, 2013	by Derek "Gamer Crash"
Coming from the NES era of gaming, I’m a sucker for good platformers and Rayman Origins definitely scratched that itch for me back in 2011. I was floored with the beautiful world, catchy music, and rock solid platforming controls. I told myself it would be pretty hard to top. 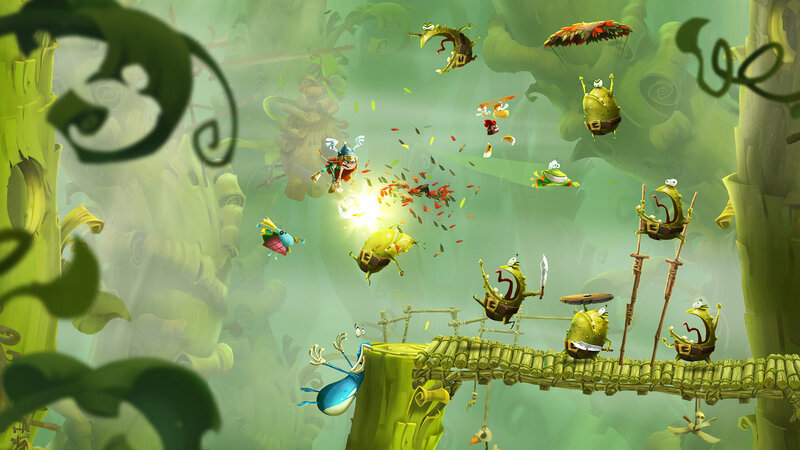 Fast forward two years and a follow-up, Rayman Legends, has finally released after a long delay. Somehow, Legends takes the already fantastic formula established in Origins and enhances it to insane levels. The biggest thing for me is that somehow Michel Ancel and his team at the Ubisoft Montpellier studio have somehow managed to improve the already stellar visuals from Origins. Not only are the colors and detail more apparent, but the play between foreground and background is equally as staggering. For example, one of the earlier levels has a large-scale castle siege going on in the background while you’re doing your platforming thing in the foreground. It’s pretty impressive to see and you can just tell that the art team had a field day. There’s a ton of little details in every level which really helps to make the game a joy to play. The UbiArt Framework is a much more powerful game engine than I originally thought as Rayman Legends proves. The other big aspect that impressed me is the overall presentation of the game. Instead of a traditional overworld map screen, you’re now in a sort of art gallery, with the ability to jump in and out of paintings. It’s a nifty little addition and one that I prefer over traditional menu options and map screens. Like most platformers, if you’re looking for some story to tie things together, well, you’re in the wrong place. Just as the only excuse Mario needs is to save a princess, Rayman only needs to hear that the Teensies are again in trouble before setting out. Honestly though, you shouldn’t really need a reason to jump in. Enough with the story though, lets get to the heart of the matter though, the gameplay. Rock solid as ever would be my response. Controls are responsive and crisp, just as you’d expect from any top flight platformer. There’s nothing worse than a platform style game with loose controls as it’s one of the more critical aspects of this genre. 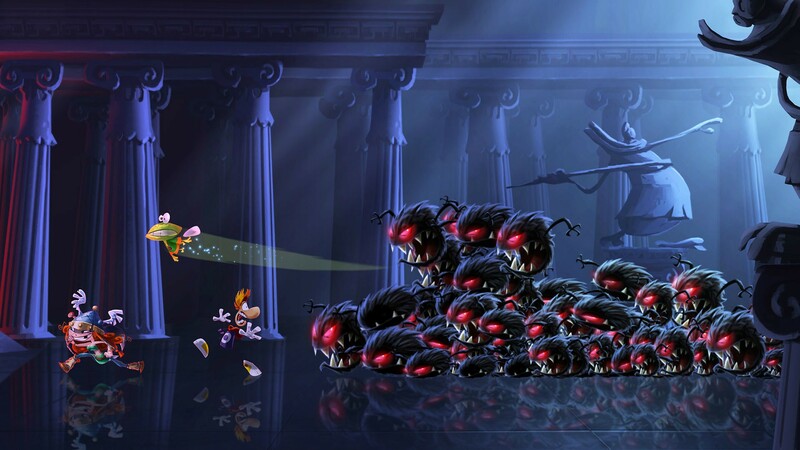 With Rayman Legends, this is an area that you do not need to worry about one bit. As with most platformers, the challenge is definitely there, but the game is completely fair about it. Legends eases you into the systems before gradually increasing the stage difficulty. I’m about halfway through and while it hasn’t always been a cakewalk, I’ve never been frustrated either. Even with the difficulty spikes on certain stages, Legends pushes fun before anything else so dying is never a reason to quit. The Murfy levels have also made their way into the Xbox 360 and PS3 versions, though instead of using the gamepad to control him as you do with the WiiU, Murfy moves to each spot on his own and with the press of the button, performs the action. You’ll always been in control of your main character during these segments. Frankly, I don’t mind this method. Yes, it’s perhaps less engaging than what the WiiU offers, but it works while keeping the flow of the level intact. On the content side of things, Legends features a massive amount of content to keep you playing for quite a while. In addition to the six game worlds to conquer (each with their own stages), you also have invasion levels which are short segments based around speed. There are daily and weekly challenges to participate in along side the online world, 40 revamped Rayman Origins levels to beat, and also a soccer mini game called Kung foot to mess around with. There’s so many collectibles to nab as well which I won’t detail out here, but as you can see, this game will keep you going for a good while. One gripe (and it’s pretty minor in the grand scheme of things) is that most of the character unlocks are basic palette swaps of the core four characters: Rayman, Barbara, Globox, and a Teensy. I would have loved to have seen some unique characters added here instead especially when you’re required to gain some huge lum totals like 750,000 and above to unlock. How cool would it have been to have seen major Ubisoft characters like The Prince, Sam Fisher, or Ezio appear in the game in the style of Rayman. Perhaps it’s just me but that would have been fantastic. Legends does feature a bigger set of unlockable characters than Origins though, even if they are just simple color swaps. Overall, if you want one of the best platformers available on the market right now, Legends is what you should grab. It’s an expertly crafted game created by masters in this genre. The game is fair yet challenging at the later levels and will keep you playing for quite a while with the wealth of content that has been added. Rayman Legends is a master class in platform design and really puts Mario on notice. Bold words, I know. Your move Nintendo. This entry was posted in Opinion and tagged games, Opinion, PC, PS3, WiiU, Xbox. Bookmark the permalink. Rayman is a beautiful piece of art. How much is it going for on retail or is it a PSN download only? Legends is out at normal retail prices for PC, Xbox 360, PS3, Vita and WiiU. Off hand, I don’t actually know if it’s digitally available on PSN. Very well could be. Highly recommend it if you enjoy platformers, I’m having a blast.